The VB-C50Fi is a fixed network camera with built-in network server, designed for those who seek the highest standard in performance and style. The VB-C50Fi features precision Canon optics and leading-edge imaging technology for smooth, high quality video capture. Compact, sophisticated design makes it perfect for use in the most stylish of environments.The VB-C50Fi connects directly to an IP network to capture and transmit live video over local networks and the Internet. Functions include motion detection, image recording, scheduling and more. The Canon VB-C50Fi All-in-one Camera and Server offers the key benefits of the a network camera, but is designed as a low-cost alternative for those not requiring pan and tilt control. It allows users to remotely monitor warehouses, construction sites, parking lots, office buildings and more with exceptional accuracy and flexibility. With the VB-C50Fi's Web server and FTP server built in, you can transmit video images directly to your PC by simply connecting your camera to your computer through the Web or your LAN. As an additional feature, the built-in network server provides viewing for up to 50 clients simultaneously. 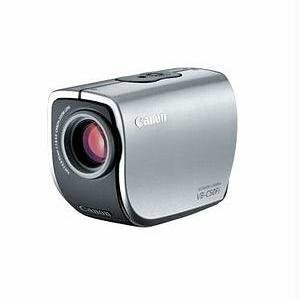 The CBC50Fi comes with an amazing 312x total zoom, making this camera perfect for intense, close-up surveillance. Utilizing a 0.25-inch 680,000-pixel CCD (charge-coupled device) sensor, this camera can achieve a resolution of up to 640 by 480 pixels. The VB-C50Fi is TCP/IP, HTTP, BOOTP, FTP, and NTP compatible, making it easy to integrate into your network video system. The VB-C50Fi comes with a varifocal lens, with a range between 3.5 and 88.3 millimeters that allows an amazing 26x optical and 12x digital zoom. For extreme low-light situations, this camera has a 1/30/sec shutter speed, a light sensitivity of one Lux with its motorized IR-cut (infrared) filter, and visibility up to 10 feet away using the IR night mode with the built-in IR light illuminator. The VB-C50Fi also features automatic image capture with 15 MB of internal storage capacity for still image recording, which can be activated by schedule, motion detectors, or contact sensors. This system supports the Canon Multi Terminal VB-EX50 Module for connecting external speakers, cameras, sensors and alarms. The VB-C50Fi camera and server provides you with a reliable, easy-to-use camera with unparalleled zoom potential, making it a powerful addition to any security system. You can define 20 position pre-sets or 10 zoom position presets as part of a scheduled tour, and you can catch the most important action by setting your camera so that it is triggered when motion is detected in one of four areas within the camera's view. Quick and easy to install, this camera comes completely assembled and ready to use. Users should note, however, that the CCD sensor may become permanently damaged if exposed to long hours of direct sunlight or halogen light. 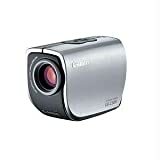 An auto-zoom camera can be remotely controlled and allows the monitor to manually zoom in on areas for clearer viewing. An auto-zoom camera, combined with a mount that has pan and tilt functionality, can be used to construct a high-end surveillance system. An infrared camera uses an infrared illuminator for low-light and nighttime viewing. Typically designed with fixed focal lengths, infrared cameras provide black and white images of nighttime viewing, and many have color capability for daylight use. VB-C50Fi camera, AC adapter and cable, Software CD, user's manual, and warranty card.